Cavitation is related to formation and rapid collapse of vapor and gas bubbles in a liquid medium: this phenomenon is usually unwanted, as these rapid collapses generate extremely high local pressure and temperature, causing the damage of metal surfaces. In hydrodynamic cavitation the liquid is forced to pass in one or more cavitational elements, which can be fixed or dynamic and of particular geometries to maximize the cavitational yeld, in which bubbles are generated and they subsequently implode in a confined chamber. In acoustic cavitation bubbles are generated by ultrasound waves and they expand and collapse because of the sinusoidal wave acting directly on the fluid. E-PIC S.r.l. licenses proprietary technology and know-how in hydrodynamic cavitation. 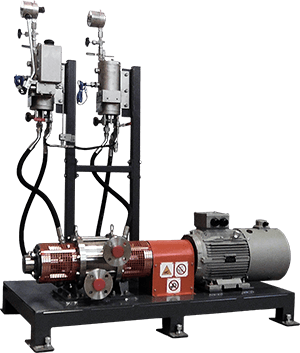 Moreover, it operates several cavitational technologies, LAB SCALE, BENCH SCALE UNITS and PILOT PLANTS to generate and control this phenomenon. E-PIC S.r.l. 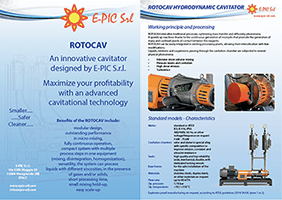 has developed a new innovative hydrodynamic cavitator (ROTOCAV), which can be installed for different applications and in different fields: download the ROTOCAV flyer, the ROTOCAV brochure and the ROTOCAV technical brochure. Visit our ROTOCAV image gallery to see pictures of our ROTOCAV hydrodynamic cavitators. Biodiesel is a biodegradable and renewable fuel. ROTOCAV E-PIC S.r.l. proprietary technology generates controlled hydrodynamic cavitation to maximize micro-mixing, mass transfer and reaction kinetics, so to produce high quality biodiesel. Vegetable oil, methanol, sodium hydroxide (or potassium hydroxide) are fed into the cavitation chamber, then they are accelerated in radial direction and subjected to strong shear stresses and cavitation. ROTOCAV in biodiesel production promotes the generation of a swarm of micro-bubbles of methoxide inside the oily continuous phase, enhancing the contact area between the two immiscible phases and optimizing the conditions to obtain a complete conversion. Biodiesel can be produced both from fresh or waste cooking oils. 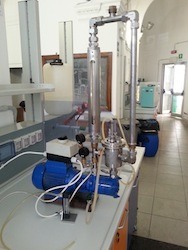 For more information read biodiesel production by hydrodynamic cavitation. Cavitation can reduce solid particles size so to increase the specific surface area, improving the kinetic of reactions and all processes involving chemical and biological reactions. For example, cavitation can be successfully applied as a pre-treatment process in disintegration of biomasses in anaerobic digestion to increase methane yield (up to 20%) and total produced biogas (up to 20%); as a matter of fact the production yield of CH4 is inversely proportional to the size of biomass particles. No more surface crust, improved mixing, use of low-cost biomasses, more produced biogas are only some of the advantages of our cavitator. For more information read biomass pretreatment by hydrodynamic cavitation. Turbulence leads to the breakup of the dispersed phase into small droplets and their homogenization. 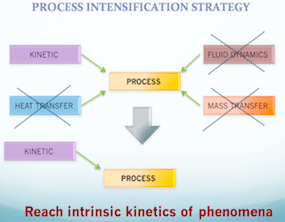 If the mechanical energy and the shear stresses generated by cavitation are strong enough, the coalescence of the liquid droplets is prevented, and a stable emulsion is generated. Some examples are: generation by cavitation of nano-suspensions of rubber by injection of gaseous bubbles in the sol-gel solution or generation of wax-water (oil-water) emulsions to make the wood waterproof. Induced cavitation can reduce the operative costs for most of applications if compared to traditional methods. For more information read hydrodynamic cavitation in the food industry. ROTOCAV E-PIC S.r.l. proprietary technology generates controlled hydrodynamic cavitation and the process is limited by the only kinetic of the chemical reactions: this means that all other limits, such as mass transfer, heat transfer and diffusion mechanisms are eliminated. For more information read hydrodynamic cavitation for chemical reactions. Cavitation promotes the formation and the subsequent collapse of micro-bubbles, thereby creating localized intense pressure and temperature conditions, resulting in the rupture of the microorganism’s cell membrane. Moreover, it is demonstrated that cavitation generates highly reactive (high oxidizing potential) free hydroxyl radicals. This results in a reduction of the chemical oxygen demand (COD). For example, cavitation can be applied in cork industry wastewater treatments to improve the performance of Fenton traditional process: FeSO4 catalyst, hydrogen peroxide and hydrodynamic cavitation could reduce COD up to 80%. ROTOCAV E-PIC S.r.l. proprietary technology can be applied also to mix flocculant agents to treat turbid water: look at the video below to see an example. Bioactive substances recovered from natural products are of great interest in cosmetic, pharmaceutical and nutraceutical, and food industries. Hydrodynamic cavitation can dramatically improve the extraction of bioactive substances from plant materials mainly through the cavitation phenomenon, turbulence and shear stress. Cavitation or "cold boiling" enhances mass transfer, avoiding heating of the bulk and so preventing thermal degradations. The hydrodynamic cavitation effect promotes the release of bioactive substances from the plant matrix by disrupting cell walls, promoting solvent access to cell content. For more information read extractions from natural products by hydrodynamic cavitation. Controlled hydrodynamic cavitation can be applied on crude oil treatment (upgrading of crue oil) to reduce its viscosity: this means lower operative costs for transfers. The treatment improves the total distillated volatiles fraction yeld and it decreases the energy demand during the refining process. ROTOCAV E-PIC S.r.l. proprietary technology generates controlled hydrodynamic cavitation for water treatment, to avoid scale deposition, corrosion and microbial growth. During cavitation, when microbulles collapse, the temperature increases up to several thousands degrees, creating suitable conditions for precipitation of calcium carbonate (at these conditions calcium carbonate is insoluble), which is separated from water, and for the rupture of microorganism’s cell membrane (bacteria and algae). Corrosion prevention, scale, biocide, energy and water savings (increase of the cycles of concentration) and extended equipment life are the main process advantages. Use our ROTOCAV hydrodynamic cavitator to homogenize pigfeed for a complete digestion: disgregation of biomasses and silages, uniform feed to the whole pig farm, maximization of yields and control of the size of solid particles. Make pigfeed more appealing, make your pigs happier! For more information read pigfeed treatment by hydrodynamic cavitation. 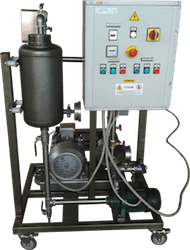 ROTOCAV hydrodynamic cavitator is a new revolutionary technology for edible oils processing: ROTOCAV can be successfully used for degumming, neutralization and bleaching of all edible oils. ROTOCAV generates very fine emulsions, increasing the surface area between the different phases and promoting chemical reactions. For more information read edible oils refining by hydrodynamic cavitation.